What's the best Instant Pot to buy for you and your family? Everyone's talking about the Instant Pot and you're fairly certain you need one, too. Right?! Only… what model and what size do you get? I understand; this is a big choice. You'll see if you keep reading that it wasn't easy for me, either. Yet now… I've been around the block with our Instant Pot. And we have 2 different sizes in our home, so I'm happy to share my advice and from my experience to help you choose the model and size for you and your family. That's what's on tap for today's #AskWardee! The Question: The Best Instant Pot To Buy? Everyone I know has an Instant Pot! I know I want one, too, but the trouble is… when I go to order one, I get overwhelmed by which model to choose and whether I should get a 6 or 8 quart? Can you help? Could you open both of the pots [6 qt and 8 qt] and actually hold them up together (the inner/liner pots) side by side? And talk about the dimensions and space required for each, the weight, etc…. And show some of the foods you were talking about like the chickens, spaghetti squash, etc. Would you please consider amending episode #048 to include you showing the inner pot liners side-by-side? And getting more into the differences of the physical attributes and space required to store the 8 quart? Not everyone has the type of kitchen space you did your presentation in and it makes it extremely difficult to assess how I could store the 8qt in an apartment sized kitchen w/o more visual/physical handling of the pot…Would really appreciate it if you would. 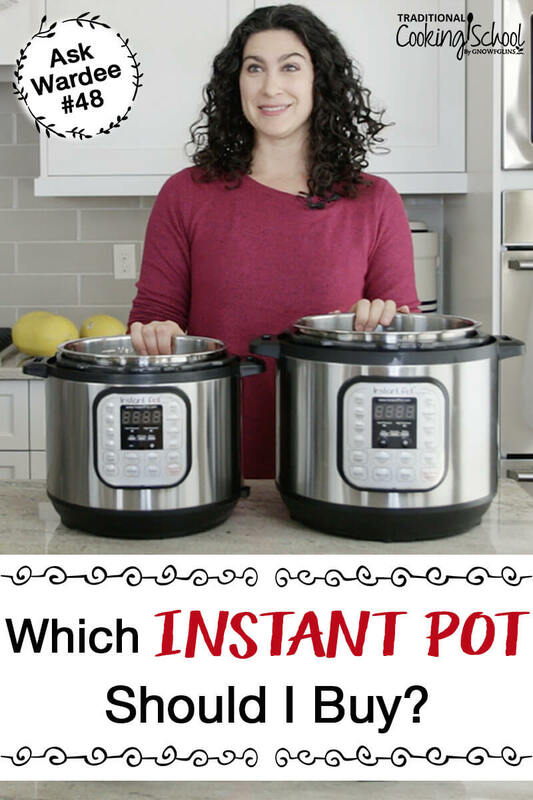 My Answer: Which Instant Pot Is Best? So you want an Instant Pot but don't know which model or size to choose. I'm happy to help! What Is The Instant Pot, Anyway? It's a multi-purpose electrical appliance. Think like a crockpot or slow cooker, except it can also do other things — it's a pressure cooker, a yogurt maker, and more. What features you get depends on what model you choose. In other words… it's a plug-n-play machine that can replace a bunch of your kitchen appliances! And it's amazing! We have 2 Instant Pots and use them both multiple times each day. In fact, I love it so much that we have an entire class on pressure cooking featuring the Instant Pot. For more info, check out the Pressure Cooking eBook & Video Package or our Pressure Cooking eCourse (the eCourse is included with all Traditional Cooking School memberships). Yet I use the Instant for much more besides… like it's my favorite way to reheat leftovers which you can learn about here. Or if you want to see 11 creative (and surprising!) uses for an Instant Pot, go here. They're fun! Often people ask me to compare the Instant Pot to other brands. I'm sorry; I'm not familiar with other brands. The Instant Pot won me over because of its high ratings, the stainless steel insert, all the recipes out there written for Instant Pot (including mine), its safety features, and friends' recommendations. I chose it and have not been dissatisfied in the least, nor inclined, at this point, to test out any others. So, while I can't comment on other brands, I do know the Instant Pot in and out and can highly recommend it. I don't think anyone could regret choosing it. When you choose your Instant Pot, you need to select both the model (Lux, Duo, Smart, or Ultra) and size (5-quart, 6-quart, or 8-quart). Let's go over the choices now. Which Instant Pot Model Should You Choose? The Instant Pot (currently) comes in Lux, Duo, Smart, and Ultra models. The Lux boasts 6 functions (Pressure Cooker, Sauté/Browning, Slow Cooker, Rice Cooker, Steamer, and Warmer). It lacks both the yogurt function (which I love — see my recipe here) and its pressure cooking function offers only high (not high and low). Read more about this model (6-quart size) here. The Duo boasts 7 functions (Pressure Cooker, Slow Cooker, Rice Cooker, Sauté/Browning, Yogurt Maker, Steamer, and Warmer) — all the ones that the Lux has PLUS the yogurt setting. Additionally, its pressure cooking setting allows you to choose low or high. The low pressure is handy with more delicate foods. Read more about this model (6-quart size) here. The Smart model has the 7 functions of the Duo, plus additional downloadable recipe programs and 3 temperature choices on the Keep Warm function. The main draw on this model is the “smart” bluetooth functionality that allows you to run it from your phone or tablet. It has other things as part of the “smart” features, too. You can read more about this model (6-quart size) here. The Ultra has some extra features that the others do not have: nearly unlimited programming via a dial that allows you to set the temperature and time you desire (high and low pressures), essentially creating your own programs, a dial interface to navigate through all the options and then you push to select, a screen that shows you more what's going on inside the machine and where it is in the “program”. It also has new sterilize, cake, and egg settings (bringing the 6 or 7 functions up to 10 total), a settings “memory” that remembers what you did last time, a self-closing weighted valve, ability to turn sounds off, altitude adjustment, dual sensors for more accurate temp and pressure readings, and 11 safety settings instead of 10 that the other models have (it has a quick release button so you can avoid scalding yourself when releasing pressure). You can read more about this model (6-quart size) here. Of the 4 options, my favorite is the Duo. Update: What About The New Ultra Instant Pot? From reading about the ULTRA, while I could see myself choosing it if I didn't already have machines, I am not sure I could justify the additional expense. Although it boasts that you can “dial in” any temp setting you want, the available range only goes down to 104F, while the low yogurt setting can go as low as 91F. So if I needed a low culturing temp, I'd just choose the low yogurt setting which the DUO already has. If I lived at high altitude, I might seriously consider the ULTRA, even though Laura at Hip Pressure Cooking says the adjustment algorithm uses “fuzzy logic”. I don't need the new programs, especially since I hardly ever use the programs on the DUO as it is. Here's what I use: High and Low pressure, Slow Cook, Saute, Keep Warm, and Yogurt. If I don't already use what I've got and I don't feel the lack of anything essential, then I don't think it's worth it to upgrade. Which Size Instant Pot Is Best For You? I went around and around for many months before buying my second Instant Pot, simply because I didn't know whether to get another 6-quart or to get a larger 8-quart. First of all, keep in mind that as with any pot that's advertised as holding a certain volume, you cannot use all of it. Advertised 6-quart volume means up to the top of the pot. Which of us ever fills a pot to the top? No one. Not if we don't want a mess! You need room for expansion, boiling, stirring, putting your foods up on a rack, etc. Once I bought a stainless steel pot for making cheese and I made a mistake. I wanted to make cheese with 3 gallons of milk, so that's the size of pot I bought. Then it arrived and I realized my error. I couldn't use the entire 3-gallon capacity; I could use only 2-1/2 to 2-3/4 gallon or so. Oops. I sent it back and got the 4-gallon stainless steel pot. And now I use it to about the 3-1/2 gallon capacity. See what I mean? Your pot needs more capacity than you'll use. Same thing with the Instant Pot. If you're pressure cooking in the Instant Pot, you cannot overfill it or you'll have a problem. The max fill line is a little more than 3/4 full. …when you're choosing your Instant Pot, choose a higher volume capacity than you think you need. You probably won't regret bigger (unless it's just waaaayyyyyy too big), but you certainly will regret too small. Whole chickens — The 6-quart will fit a 5 to 6 pound whole chicken comfortably. The 8-quart fits (2) 5 to 6 pound whole chickens comfortably side by side. Yogurt — The 6-quart will make 4 to 5 quarts of yogurt comfortably (see my recipe here) while the 8-quart will make 6 to 7 quarts of yogurt comfortably. Spaghetti squash — A medium size or 2 smaller will fit in the 6-quart Instant Pot; 2 medium or even a large spaghetti squash (depending on how long it is) will fit in the 8-quart. Batch cooking — If you batch cook at all, whether rice, beans, pre-cooked chicken, etc., you will fit more in the 8 quart, making your efforts stretch farther. Accessories — Many of the accessories I chose (cheesecake pans, stackable pans, etc.) fit in both the 6-quart and 8-quart Instant Pots. An exception is the stackable pans I showed you in the second video above. Those ONLY fit the 8-quart Instant Pot. However, there is greater capacity for stacking and using larger containers inside the 8-quart Instant Pot. Wondering what I'm talking about? Like making this sourdough cornbread in a 7-cup Pyrex bowl — it will fit in either size Instant Pot. See the second video above for real-life examples of how these foods fit in the 6-quart or 8-quart Instant Pot! If you'd like more ideas for using your Instant Pot, be sure to check out 11 Creative & Surprising Things To Make In The Instant Pot. I think some will astound you! No matter what your family size is, if you batch cook or cook larger sized whole foods, get the 8-quart. If your family is larger (4 or more persons), get the 8-quart. If your family size is 1 to 2 and you also do batch cooking, get the 8-quart. Or, if your family size is 1 to 2 but you rarely do batch cooking nor cooking of larger whole foods (like whole chickens or medium/large spaghetti squash), get the 6-quart. In terms of model, I chose the Duo. It has the 7 functions, including yogurt and low pressure. I'm glad I have those (the Lux doesn't come with those). I have no need or desire for “smart” functionality or the additional features of the Ultra. Size, though? This was tougher for me! When I purchased our first Instant Pot, the 8-quart wasn't even available. So I chose the 6-quart (rather than the 5-quart). That was a no brainer. Then the 8-quart came out. I knew I wanted to get another Instant Pot, but I hemmed and hawed for months because the 6-quart was working pretty well for me. If I knew then what I know now, and I were purchasing my first Instant Pot all over again, I would actually choose the 8-quart because the extra room makes a significant difference in batch sizes for batch cooking or large family cooking. And even with normal size meals, there's not much extra room in it. Which means, it's not too big. My pick for the small family that does not do batch cooking or cooking of larger whole food items: the Instant Pot IP-DUO60 (6-quart Duo model). My pick for the small or larger family who does batch cooking or cooking of larger whole food items: the Instant IP-Pot DUO80 (8-quart Duo model). Which Instant Pot is best for YOU? Which size Instant Pot do you have? Are you happy with it? Do you have more than one Instant Pot? Excellent break down thank you Wardee. All I would add is you can always make less in a large pot but never more in a small pot…. So just to make sure, as I am sitting here on the fence on the 6l or 8l… there is not a “lower limit” minimum on the 8l to make it work? Meaning, there is no “fill to here” line on the minimum end to make it work properly? So it is true, that you cannot make too little of something? I thought that for pressure cooking, there had to be a minimum fill? 1/3 of the pot, I think? that’s the reason I went for the 6 quart, since we’re just two people, even though we do plan to do some bath cooking. I’m thinking of getting the 3q. What is your opinion? I have a 3, 6 & 8 quart. I love my 3 quart. It’s great for making sides like rice or veggies while my 6 quart is cooking the meat. One thing to consider is a lot of the accessories won’t fit in the 3 quart. I have been off your website for quite a while and I was pleasantly surprised to see you again, you are looking fantastic !!! 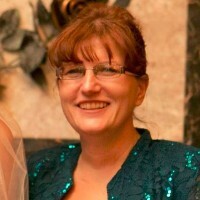 I have not yet shedded my baby weight (4 pregnancies in 6 years !!!) but I am getting healthier slowly but surely, I have been using lots of your recipes, they have become family favorite recipes. I love your review of the instant pot, I am not sure if I can get one here in Guatemala but I am looking forward to switching from slow cooker to instant pot as soon as I can find one here and come back to see your recipes !!!! Keep up the excellent work !!!! I’ve been researching electric pressure cookers for awhile, and the Instant Pot and the GoWise (both 8 qt.) are my favorites in theory. The GoWise is quite a bit less expensive, but I know the Instant Pot is well loved. Curious if anyone has thoughts on one vs. the other? Drema – At least 2* quart size jars fit in the 8 quart Instant Pot, however they go over the max fill line so I would recommend using the slow cooker setting rather than any setting that pressurizes. *It’s possible 3 would fit but I would have to verify this! Do you recommend adding the protection plan when purchasing the Instant Pot? I have an instant pot because I learned about it from you! I like that it is stainless steel and not non-stick. I use my pyrex dish like you do but I put a dessert size correlle plate on it for a lid. I also make custard with 1 cup wide mouth canning jars. Last week I made Boston Brown Bread in wide mouth pint jars with recipes from the internet. I am new to canning, and want to get a pressure caner. If i bought this would i be able to can meat, and other things besides jelly in it ? Thank you. You won’t be able to can in an Instant Pot. It’s for pressure cooking only and isn’t approved for any canning. For canning you’ll want a pressure canner. Millie…this does not make sense to me. Both items use controlled pressure and heat in a sealed container. I have been using the IPot to can so I would like the technical explanation for why there would be a discrepancy if you would be kind enough to share. Because the pressure cooker is regulated by a pressure sensor instead of a thermometer, the actual temperature may change based on the elevation of your location. Even in the Instant Pot Max, which can reach 15 PSI but canning is still not recommended over 2,000 ft.
Water bath canning can be done but pressure canning is not recommended. I thought what I read that you would he able to can(pressure can) in the IPOT. Just not several jars at a time. I am so glad I found your article on the IPOT, and yes I would like to have one. Thank you for the information. First time poster! I noticed you stated in the video that you made all of the recipes for the 6qt version of the IP. Are the 6qt recipes on here not usable in the 8qt? I’m not familiar with the IP at all and just wanted to ask if it was something I could put a 6qt recipe in and it would come out right or will I have to do a bunch of scaling down/up to make the recipe work? Great analysis, Wardee. Thank you! I’m a batch cooker for 1, so I’ll go with the 8-quart. But now how about between the Duo and the new Ultlra? I don’t care about bluetooth and using my phone to control the IP so agree with you about the Smart but the Ultra is a different story. Help! I’m sorry. Wardee isn’t familiar with the Ultra at this time. I wish we could help! Thanks, Millie. Yeah, the Ultra is their newest model. Would hate to buy the Duo and start reading rave reviews on the Ultra. I’ll watch and wait a bit. I saw your video on the size and just have one critical question! I am already sold on getting a instant pot. but I am still a bit stuck on choosing the 6 or 8 quart pot. My question is if I get a 8 quart, will small 1-2 people recipes still work fine in a 8 quart? There are times where I need to cook for 4-5 people, and sometimes just 1-2 for the house. I just wanna make sure that with the 8 quart, I can cook both small and large servings of meals! There is no minimum amount of food needed in the IP as long as the minimum liquid is used (check your manual for more information). Plus, you’ll have room for larger batches if you’re serving more people. Right now the 8 qt is less expensive on Amazon than the 6 qt. Thank you for helping me to decide on the larger pot; short of photos showing one/two chickens in them, this is great. Wardee doesn’t have any experience with it, but it looks good. The new functions for customizing pressure levels, for cakes, and other things sound good if you really need them. It has everything the DUO has (Wardee’s current recommendation) but extra things as well if you need those. This is great information. Thank you SO much! You have really helped me. It is Christmas time and I was just shopping price and was not aware of their differences. Now I can make a bettter decision other than hurt price. What size pressure cooker will hold a 3 lb pot roast? The 6 or 8 quart will hold a 3 pound roast. Hi, this is the first time I’ve been to your website. Thank you for this post! I’ve been pulling my hair out trying to figure out which size to get! There are only 2 in my family, but I do like to cook whole chickens and large turkey breasts to freeze meat (shredded) for recipes. I did not know that you can use 6 Qt recipes in the 8 Qt pot (with increasing the liquid, I’ll read my manual!). I’m off to order an 8 quart Duo. Thanks again! Wardeh, I have been reading through your replies. What a doll. Thank you for “talking through” the decision on what size pot. That is exactly how I think. Also, I was wondering about canning and that question came up and was answered. Perfect. Thank you! Thanks so much for your kind comment. 🙂 Wardee appreciates it! You have no idea how much time you saved me! I was having a hard time deciding which size to choose. Your review and comments were great! Well, this helped a bit 🙂 We are a family of 3. Although I usually wind up cooking for just my daughter and myself and my husband does his own thing, depending on what I’m making. Sometimes I batch cook. But usually I just make 1 large-ish batch and we eat the same thing 2 to 4x during the week. Not enormous batches for freezing. I sometimes do that and then find we don’t actually use anything and 12 months go by and I’m clearing out the freezer and realize I have bags and bags worth of stuff I froze and we never ate. My biggest deciding factor is cost. The 6qt Duo is currently on sale for over 40% off and is $59 vs the 8qt being $140. If I wind up not liking or not using the Instant Pot, it will be a lot easier to stomach having spent $59 rather than $140. And with the learning curve involved, I figure I would want to go smaller and spend less initially. I can always upgrade later if I find that I need (or want) the 8qt. I will be cooking for only myself mostly, and I have decided that I want the Duo model. I’m wondering about size..6 or 8 qt? One thing I like to make is baked beans. I use a 2 pound bag of navy beans and use my Dutch oven at present for baking in the oven. Then I freeze portions as it’s a large batch of cooked beans. What size should I get? 6 or 8 qt? Also, what do you mean by “batch cooking”? When cooking foods that expand in the Instant Pot you should not fill more than 1/2 to 2/3 full. So for the 6 qt that would be 6 to 8 cups; the 8 qt would be 8 to 12 cups. I usually do 1 pound of dried beans in my 6 quart. Hope this helps. Thank you so much for this information, it is exactly what I needed to know to make the decision as to which Instant Pot to buy. Thanks for your clear and practical guide on choosing the right Instant Pot for one’s circumstances. I love my IP Duo60 and it takes much less space to store in a condo kitchen than my rice cooker (very slow) my slow cooker (ceramic liner heavy and hard to lift) and my beautiful WMF stovetop pressure cooker (worked great but had to be babysat.) so nice to set the IP and walk away, even when pressure cooking. I’ve seen some videos of the Ultra in use and have been drooling over some of the new features, like monitoring the progress. Thanks to your comparison I will stop looking for an excuse to upgrade. What I have does more than I need. Just wish I could have bought it at today’s prices. Hi Wardee, where is the best place to purchase an Instant Pot? Really interested in this esp. for making bone broth! Thank you and have a very Blessed CHRISTmas. The Instant Pot can be found at many top retailers as well as online. Just got the IP Duo 8qt at Meijer for $99.99! So happy. Can’t wait to use it. Thank you for all your help. Love and Blessings in JESUS. OH! My! Goodness, you are just so sweet to watch! Your hair is looking great! nice firm curly, shinny! Thank you Wardee for all your effort. Wardee, thank you for the updated review. I appreciated the size comparisons. I am still on the fence on size, while it is just two of us, I do still entertain family and friends from time to time. (I had the, IDK, 6 qt crockpot, got the smaller maybe 4 qt one, and went back to the larger one, over the past couple of years) The stackable pans fitting only the 8 qt may well weigh into my decision. I am guessing the stackable pans are for cooking two different dishes at the same time, ie, a main dish and a side. Are there no stackable pans that fit the six qt? Is there any way around that? You had me convinced on the duo from the original video. I don’t need all that connected stuff either! Your new kitchen looks beautiful! I am glad you all made the move safely, and hope you enjoy your first Christmas in your new homes! The stackable pans we used to recommend fit the 6 quart. They went out of stock and no indication of returning. The new set we recommend does not fit the 6qt, unfortunately. Yes they are for doing 2 different dishes. Or two of the same of dishes that need to be contained, like 2 cheesecakes or 2 bread puddings, etc. This was extremely helpful! Thank you for taking the time to break this down. My family is small, but I like to sometimes cook and freeze soups and we like to entertain. So while I had narrowed my choices down to the Duo, your explanation helped me to settle on the 8 quart. I will check out your recipes one our Instant Pot arrives. Thank you! I am so happy you found this helpful 🙂 You are very welcome, let us know if you have any questions. Hello, you mentioned that you prefer the DUO model 8 qt size, as it has yogurt function and low and high pressure cooking. Could you please tell me what food or recipe would require the low pressure function? We use the low-pressure function for desserts like cheesecakes. Thank you for doing this video – it was very helpful! I’m leaning towards the 8 qt because I love to make large batches of bone broth, but other than bone broth I do not have a need for large volumes. Do you know if there is a minimum fill level for the 8 qt? For instance, can I make only 2 qts of yogurt? Or 3 qts of soup? Thank you again for your help, I really appreciate people like you that do so much to make our daily lives better. Hi Wardee! Thank you for the excellent video! It has helped me to make a decision as to what size Instant Pot I will purchase (8 quart). Can the machine also make bread? Great question, Deborah! Wardee and her daughter have made cornbread, muffins and bundt cakes in the Instant Pot, but not bread. They have made bread, too (as featured in the Pressure Cooking II eBook), but not kneaded bread. I hope you enjoy your Instant Pot!